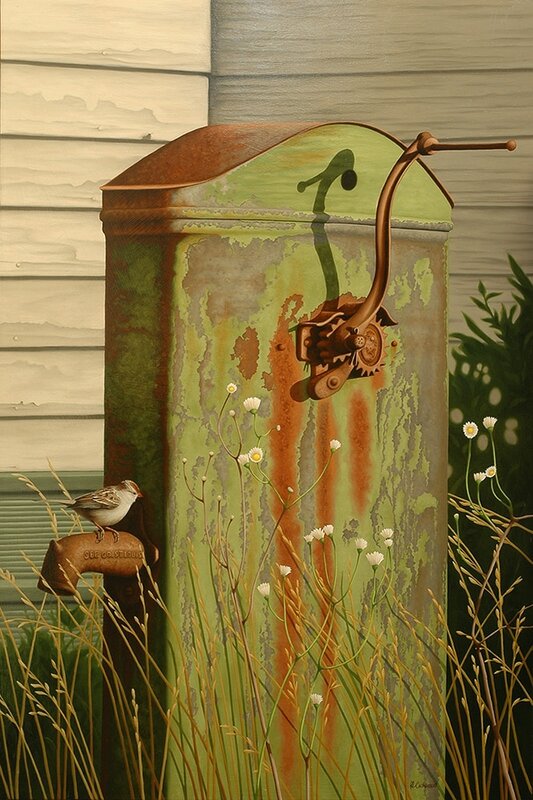 "On Tap (White-crowned Sparrow) "
This painting, a few years in the making, is composed from several different reference photos, including a few from Tulsa, Oklahoma. I first visited Tulsa in 2009 and met a very nice couple who enjoyed my work and soon after became collectors. Over the next year, we realized that we shared an appreciation for old (aka antique) items. So when I returned in 2010 for my first solo exhibit at Lovetts Gallery, we made plans to walk the fields outside of Tulsa looking for old farm equipment and oil pumps, which I was eager to find and use for future works. While I was there, they invited me to their house, where I saw this old water pump. The pump once was installed atop a well so that you could pull water up by using the crank on the side. Inside the pump were two gears connecting a chain from the top of the well to the bottom. Little buckets were attached to the chain that would carry the water up and dump it into a trough that lead to the spigot. It’s not only a neat device but also one that I knew would make a great painting. The bird perched on the spigot is a juvenile White-crowned Sparrow that we saw while out on our walk. It seemed like the perfect pairing.